DM - Cardiology, MD - General Medicine, M.B.B.S. Dr. Gurcharan Singh Kalra, MBBS, MD (Medicine), DM (Cardiology) is the Director of Cardiac Catheterization Laboratories of Fortis Hospital, Mohali. Preceedingly, he was associated with the famous G.B. 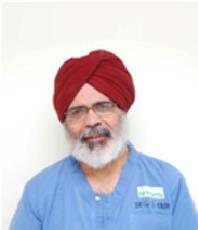 Pant Hospital, New Delhi where he contributed 13 distinguished years as a Consultant Cardiologist and Interventionist. After completing his basic medical studies MBBS, he pursued his MD(Medicine) from the renowned institute, AIIMS, New Delhi, followed by DM in cardiology from the same institute, which was tailed by a fellowship from the university of Birmingham, Alabama USA. During his illustrious career, he has to his credit more than 15,000 complex coronary angioplasties. He is a pioneer in starting primary angioplasty in Punjab, and has performed the maximal primary angioplasties in this region with minimum Door to Balloon time, which is better than any cardiac centre not only in India but around the world. He is at present doing all coronary procedures through radial route. Till date, he has done about 40,000 interventional procedures. Dr. Kalra shows, special interest in device closure of valvular defects and has introduced the use of several closure devices such as Rashkind Umbrella Device, Siders Buttoned Device, Asdos, Cardio Seal, Starflex, Coils and Ductocclud. He has not only initiated device closure and metallic commissurotomy at several leading hospitals around India, but has also conducted live demonstrations at Hospital Charles Nicolle, Reven, France. Ballooning of Aortic and Pulmonary valves. An internationally recognized Cardiologist, Dr. Kalra is the convener of the Cardiac Registry of India. He has been actively involved in research presentations and has published papers in more than 200 national & international medical research journals. He has also trained cardiologists from USA, Australia & France in device closure and mitral volvotomy.